Trump warns of a stock market bubble. Is he right? 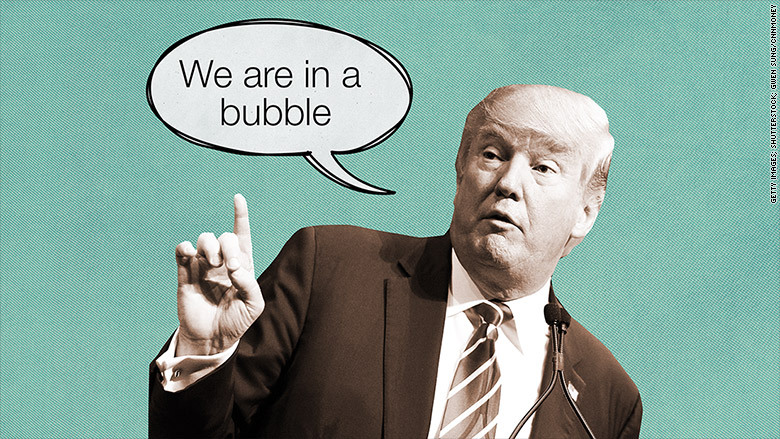 Donald Trump has an urgent warning for Americans: The stock market is in the midst of a bubble. The billionaire businessman told The Hill this week he's concerned people are "being forced into an inflated stock market and at some point they'll get wiped out." "We're in a bubble right now," Trump told The Hill. Trump joins a number of prominent figures who think easy money, fueled by the 0% benchmark interest rates from the Federal Reserve, has led to a bubble in stocks. The S&P 500 has more than tripled since early 2009 and despite a recent pullback is sitting near all-time highs. 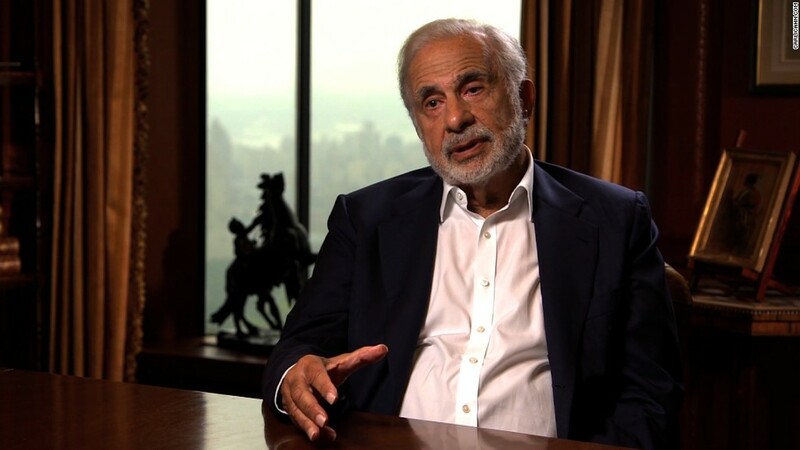 Carl Icahn, the billionaire Trump wants to hire as his Treasury secretary, warned of a looming "catastrophe" last month in a video dubbed "Danger Ahead." Icahn called into question high valuations in the stock market driven by "financial engineering" and "suspect" earnings. Robert Shiller, a market scholar at Yale University, recently told the Financial Times that investors are more fearful about valuation than at any time since the dotcom bubble in 2000. "It looks to me a bit like a bubble again," Shiller said. It's important to remember bubbles are notoriously difficult to time. During the late 1990s dotcom bubble, or the early 2000s real estate bubble, valuations raced higher for years before eventually popping. So far these bubble doomsayers appear to be in the minority. While many acknowledge the U.S. stock market is expensive, none of the market strategists CNNMoney polled believe there's a bubble brewing. "We are a long way from bubble territory. I don't think it's right to say the broader U.S. equity market is in a bubble," said Russ Koesterich, chief investment strategist at BlackRock. They point to the real momentum the U.S. economy has gathered since 2009. While the economy isn't going gangbusters, six years ago there were legitimate fears of a depression. Today the U.S. is adding millions of jobs a year and corporate profits are near all-time highs. "The broad U.S. economy is actually in decent shape. The notion all of this was built on cheap money is not right," Koesterich said. Terry Sandven, chief equity strategist at U.S. Bank Wealth Management, believes that "classic signs of market froth are not evident." The market strategists CNNMoney polled pointed to the following metrics as signs that while stocks are pricey, they're not in bubble territory -- yet. Excessive enthusiasm about stocks is never a good sign. Yet this contrarian signal is not even flashing yellow right now. In fact, just 25% of financial advisors polled by Investors Intelligence in late September were bullish on stocks. That was the lowest level since March 2009. While that figure has since climbed, it's well below the 2015 peak. In fact CNN's Fear and Greed Index, which tracks seven indicators of investor sentiment, is flashing "fear" currently. The index has recovered from "extreme fear," but it's not in the "greed" territory yet. Stocks are not cheap, but valuations aren't outrageous either. The S&P 500's forward price-to-earnings ratio is currently 15.8, according to FactSet Research. The firm says that's down from 17.2 in late February and well below the dotcom peak of nearly 27 in late 1999. P/E ratios are a reflection of stock prices compared with future profits. "While the U.S. stock market is fully valued...we do not believe it is in a classical bubble," said Kristina Hooper, U.S. investment strategist at Allianz Global Investors. During bubbles, everyone from your dentist to your mailman is racing to toss money in the market. That's hardly the case today. Investors have actually yanked $113 billion from U.S. equities so far this year, according to a CNNMoney analysis of fund flow data from the Investment Company Institute. Stock market bubbles are typically associated with a rush to bring companies public. But the IPO market has actually been pretty lackluster this year. Roughly $30 billion was raised in the IPO market through the end of last week, down from nearly $81 billion at the same point of last year, according to Ipreo Capital Markets. 5. Biotech, social media bubbles? Of course, none of this means a bubble isn't brewing under the surface. And even market bulls acknowledge certain corners of the financial markets look inflated. "There are parts of the market like private equity, social media and biotech that are looking very frothy," said BlackRock's Koesterich.